This rustic Pine Cone Branch Floor Lamp features realistic pine branches and pinecones highlighted with gold tint. Made of iron and hand-crafted this rustic floor lamp is available in your choice of black or rust finish and includes a faux calf-skin shade to compliment your rustic decor. Made in the USA. 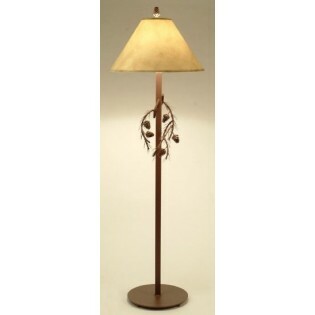 This rustic Pine Cone Branch Floor Lamp features realistic pine branches and pinecones highlighted with gold tint. Made of iron and hand-crafted this rustic floor lamp is available in your choice of black or rust finish and includes a faux calf-skin shade to compliment your rustic decor.